This was where Ezekiel’s visionary tour of the temple began (Ezekiel 40:6). Also, many years before, in a vision Ezekiel saw the glory of God depart from the temple, and it left through the east gate (Ezekiel 11:23). 2 where I saw the brightness of the glory of Israel’s God coming from the east. 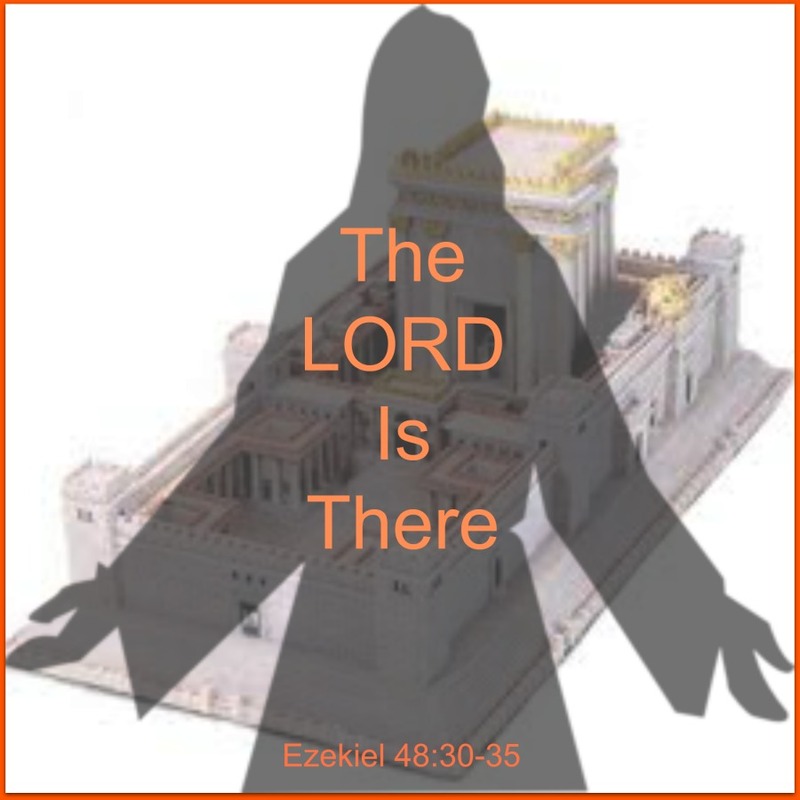 Ezekiel’s temple was nothing more than a building. With the glory of God, it was a sacred place, a habitation for God and the radiance of His presence. It is hard to define the glory of God; we could call it the radiant outshining of His character and presence. The Bible says that God’s glory radiates throughout all His creation (Psalm 19:1-4). Yet there is also the concept of the visible, tangible glory of God – the shekinah – and this is scattered about the Old Testament. In many cases it is described as a cloud. The sound I heard was as loud as ocean waves, and everything around was shining with the dazzling brightness of his glory. 3 This vision was like the one I had seen when God came to destroy Jerusalem and like the one I had seen near the Chebar River. Though Ezekiel had seen this vision of the glory of God twice before (in Ezekiel 1 and Ezekiel 10-11), it was in no way a familiar or comfortable sight. In holy reverence to God, he fell on his face (ESV). The sense is that Ezekiel didn’t choose to do this; it was a natural response. 4 and the Lord’s glory came through the east gate and into the temple. 5 The Lord’s Spirit lifted me to my feet and carried me to the inner courtyard, where I saw that the Lord’s glory had filled the temple. 7 Ezekiel, son of man, this temple is my throne on earth. I will live here among the people of Israel forever. Yahweh proclaimed that He had come back to the temple to reign. It was His throne, where He would stand and where He would abide. They and their kings will never again disgrace me by worshiping idols at local shrines or by setting up memorials to their dead kings. 8 Israel’s kings built their palaces so close to my holy temple that only a wall separated them from me. Then these kings disgraced me with their evil ways, and in my fierce anger I destroyed them. 9 But if the people and their kings stop worshiping other gods and tear down those memorials, I will live among them forever. When Israel thought of themselves living near or beside God, they did not honor and obey Him fully. God’s true desire was to dwell in their midst forever, and to do so as part of a new covenant transformation of Israel. 10 The people of Israel must suffer shame for sinning against me, so tell them about my holy temple. Let them think about it, 11 then if they are truly sorry, describe for them the design and shape of the temple, the gates, the measurements, and how the buildings are arranged. Explain the regulations about worshiping there, then write down these things, so they can study and obey them. The greater message for Ezekiel and the exile community was, God isn’t finished with you yet. He will gather, rebuild, restore, and bring His glory. Yet this message wasn’t communicated with fairy tales and wild stories, but with the prophetic declaration of real things that would surely happen. 12 The temple area on my holy mountain must be kept sacred! This is the most important law about the temple. After the description of God’s glory and the promise of His abiding presence, Ezekiel went back to describing the place of sacrifice. Like every true altar of Yahweh, this altar points to the cross, and the finished work of Jesus Messiah upon the cross. 13 According to the official standards, the altar in the temple had the following measurements: Around the bottom of the altar was a gutter twenty inches wide and twenty inches deep, with a ten inch ledge on the outer rim. 14-17 The altar rested on a base and had three sections, each one of them square. The bottom section was twenty-seven feet on each side and three feet high. The middle section was twenty-four feet on each side and seven feet high, and it had a ten inch rim around its outer edge. The top section, which was twenty feet on each side and seven feet high, was the place where sacrifices were burned, and the four corners of the top section looked like the horns of a bull. The steps leading up to the altar were on the east side. These may be fairly regarded as memorials pointing back to the work of Jesus. Animal sacrifices were never actually effective for the cleansing of sin, only as representations and shadows of the future reality fulfilled by Jesus the Messiah in His crucifixion. Even so, the literal presence of these sacrifices does not mean that they should or could be regarded as effective for the cleansing of sin. Much as the bread and the cup of the Lord’s Table is a powerful spiritual representation and memorial of Jesus’ work on the cross, these sacrifices can be regarded in a similar way. 19 The priests of the Levi tribe from the family of Zadok the priest are the only ones who may serve in my temple—this is my law. So give them a young bull to slaughter as a sacrifice for sin. 20 Take some of the animal’s blood and smear it on the four corners of the altar, some on the corners of the middle section, and some more on the rim around its edge. That will purify the altar and make it fit for offering sacrifices to me. 21 Then take the body of the bull outside the temple area and burn it at the special place. 22 The next day, a goat that has nothing wrong with it must be offered as a sacrifice for sin. Purify the altar with its blood, just as you did with the blood of the bull. 23 Then choose a young bull and a young ram that have nothing wrong with them, 24 and bring them to my temple. 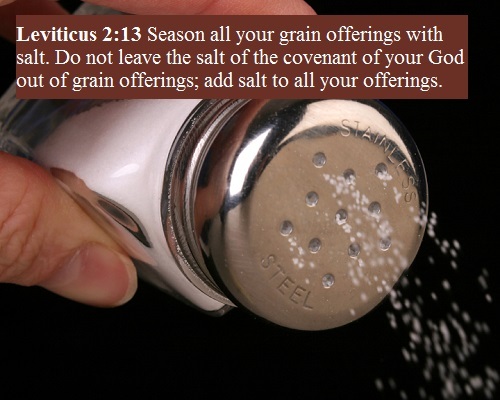 The priests will sprinkle salt on them and offer them as sacrifices to please me. 25 Each day for the next seven days, you must offer a goat and a bull and a ram as sacrifices for sin. These animals must have nothing wrong with them. 26 The priests will purify the altar during those days, so that it will be acceptable to me and ready to use. 27 From then on, the priests will use this altar to offer sacrifices to please me and sacrifices to ask my blessing. Then I will be pleased with the people of Israel. I, the Lord God, have spoken. As we read these chapters about plans for a temple, a place to worship the Most High God, I want us to hear some of the hymns that have been sung for many generations in many different countries and denominations. These are some of a Christian’s most precious treasures! HERE is “All Hail the Power of Jesus’ Name.” The hymn is often called the “National Anthem of Christendom.” The lyrics, written by Edward Perronet while he served as a missionary in India, first appeared in the November 1779 issue of the Gospel Magazine, which was edited by the author of “Rock of Ages,” Augustus Toplady. 1-2 After the man and I left the temple and walked back to the outer courtyard, he showed me a set of rooms on the north side of the west building. This set of rooms was one hundred seventy feet long and eighty-five feet wide. 3 On one side of them was the thirty-four feet of open space that ran alongside the temple, and on the other side was the sidewalk that circled the outer courtyard. The rooms were arranged in three levels 4 with doors that opened toward the north, and in front of them was a walkway seventeen feet wide and one hundred seventy feet long. 5 The rooms on the top level were narrower than those on the middle level, and the rooms on the middle level were narrower than those on the bottom level. 6 The rooms on the bottom level supported those on the two upper levels, and so these rooms did not have columns like other buildings in the courtyard. 7-8 To the north was a privacy wall eighty-five feet long, 9-10 and at the east end of this wall was the door leading from the courtyard to these rooms. Ezekiel’s radiant guide took him away from the temple building back to the outer court. There they noted gallery against gallery in three stories. These held chambers or rooms. There was also a set of rooms on the south side of the west building. 11 These rooms were exactly like those on the north side, and they also had a walkway in front of them. 12 The door to these rooms was at the east end of the wall that stood in front of them. These rooms on the north and south sides of the temple are the sacred rooms where the Lord’s priests will eat the most holy offerings. These offerings include the grain sacrifices, the sacrifices for sin, and the sacrifices to make things right. 14 When the priests are ready to leave the temple, they must go through these rooms before they return to the outer courtyard. They must leave their sacred clothes in these rooms and put on regular clothes before going anywhere near other people. 15 After the man had finished measuring the buildings inside the temple area, he took me back through the east gate and measured the wall around this area. 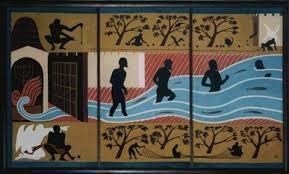 16 He used his measuring stick to measure the east side of this wall; it was eight hundred forty feet long. 17-19 Then he measured the north side, the south side, and the west side of the wall, and they were each eight hundred forty feet long, 20 and so the temple area was a perfect square. 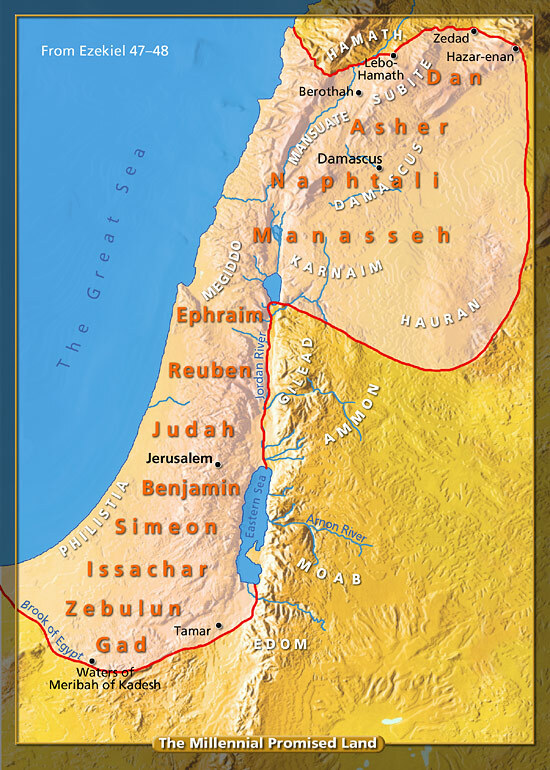 This is a large area, much larger than the present temple mount. The wall around this area separated what was sacred from what was ordinary.